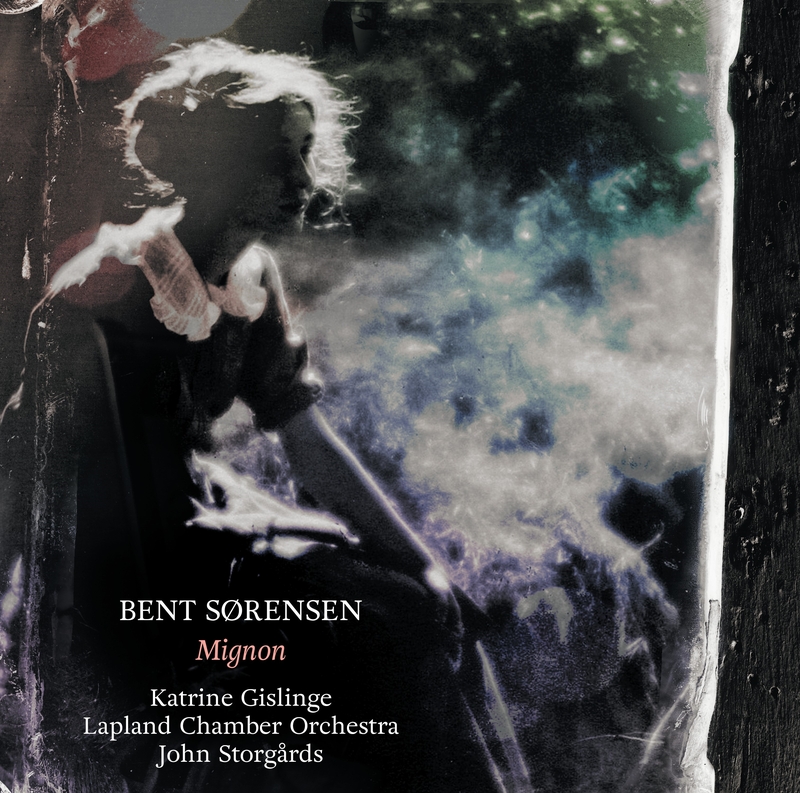 Delicately dancing with silence, Bent Sørensen’s tender piano concerto Mignon –part of his Papillons trilogy – reveals textural beauty and melodic elegance in a language both modernist and sweetly nostalgic. The piece was written for Katrine Gislinge, one of the most significant pianists in Scandinavia, and on this premiere recording she is accompanied by Lapland Chamber Orchestra, conducted by John Storgårds. An accomplished violinist, Storgårds even performs Sørensen’s two pieces for solo violin, Serenissima and The Lady of Shalott. Also included are the premiere recordings of two ensemble pieces – the classically inspired serenade Ständchen and the teasingly tuneful Sinful Songs. "A composer of his time, and also a wholehearted neo-romantic. That is Bent Sørensen." "Welcome to the dreamworld of Bent Sørensen"
"Powerfully empathetic playing by Lapland Chamber Orchestra"
"What is heard is some exceptionally wonderful music"
I. Andante 5:05 9,60 kr. II. Fluente 1:04 6,40 kr. III. Moderato cantabile molto espressivo 1:34 6,40 kr. IV. Allegretto 3:51 6,40 kr. VI. Scherzando 2:55 6,40 kr. VII. Calmo con delicatezza 4:34 6,40 kr. SERENISSIMA (2014) 5:13 9,60 kr. THE LADY OF SHALOTT (1987; 1992) 7:26 9,60 kr. THE WEEPING WHITE ROOM (2002) 7:42 9,60 kr. Composers of the past may have viewed silence as a void to be filled; the blank page that stares up at the writer. But for Bent Sørensen, silence is proving a commodity of increasing preciousness and fertility. More and more, silence is casting its spell over Sørensen’s music – both as an integral and provocative element of the discourse, and as a sound so suddenly and so beautifully resonant that his own notes must tread carefully and quietly out of its way. In that sense, we can talk of Sørensen’s career as a process of distillation as much as development. He has written for single instruments and for gargantuan orchestras with multiple soloists attached. But whatever the scoring, the sonic fingerprint of Sørensen’s music remains consistent. That goes beyond overarching goals like textural beauty and delicacy of counterpoint, and reaches into the music’s actual anatomy: its standard-interval melodies; its distinctive smudged tonality; its frequent high registers; its supplementary vocal sounds or physical instructions; its many echo effects and thematic reflections. ‘From the moment we are born, there is one way – a slow slippage into decline.’ So said Søren­sen in the mid 1990s when his violin concerto Sterbende gärten was first performed. Those words could preface almost every work he has written since; perhaps they also sowed the seeds of his music’s increasing quietness. But despite the neo-Romantic longing and teasing obsession with the past that characterises his work, Sørensen is a modernist who speaks of the here-and-now. When musical ‘traditions’ are glimpsed in his pieces – passing fugues or folk songs, fragments from old masters – they are partially concealed or yanked out of view before they can become reassuring or trite. That, or they appear wrecked from the start: too decrepit to touch, emotionally unavailable. Sørensen makes them so, just as he himself summons the silences with which his notes so delicately dance. Papillons is a trilogy of scores dating from 2013-14 consisting of Pantomime, Rosenbad and Mignon. Each uses the same central piano part across its movements, but each varies the order those piano movements are played in, and each places it in a different instrumental context: ­Pantomime is scored for piano and ensemble, Rosenbad for piano quintet, and Mignon for piano and strings (string orchestra, two string quartets and two solo violins, positioned spatially around the stage and audience). As a result, Sørensen tells ‘the same totally different story’ in each piece. What might that story be? String phrases in Mignon’s opening ‘Andante’ rise and fall – blossom and decay – while the piano suggests a veiled shape built from Sørensen’s hallmark tonal intervals that emerges as a clear theme. Suddenly the music appears to fall into darkness, only to be invaded by the light of quietness and consonance. Here and in the following ‘Fluente’ there are fragmentary glimpses of Mozart and Bach; drifting, dreamlike quotes reference their music but so does the empty white space that surrounds Sørensen’s notes, giving them fresh, High Classical air to breathe. Harmonies develop like smoke – forming suddenly, only to disintegrate just as rapidly. The ‘Moderato’ appears powerless to resist the downward slide of its swarming strings, who now have no piano for assistance. The ‘Allegretto’ spins off like its own subconscious dream, but soon comes back, settling into a tight tapestry with all four string groups before the untitled fifth movement arrives, coy and hesitant in the face of pure silence. Here, only the human voices of the string players can soften the piano’s path. They pick up that same minor-third interval (now on their instruments) in the jumpy ‘Scherzando’, which reaches its own fragile equilibrium before the piano’s repeating motif in the final movement coaxes the instrumentalists into collaboration. Eventually, the sound of bow on string is replaced with that of sandpaper on wood. All the while, volume settings are resolutely low; some notes hardly birth all, while chunks of the score are opened-up by the white space of rests – air, nothingness. That increases the fragility of the piano, on which a note either sounds or doesn’t sound (unlike a stringed instrument). But the lightness and tenderness of Sørensen’s piano writing, like the butterfly of the series title Papillon, has a very personal impulse, too: Mignon and its companion pieces were inspired by and written for his wife, the pianist Katrine Gislinge. In 1987 Sørensen saw John William Waterhouse’s painting The Lady of Shalott at the Tate Gallery in London. The memory of the painting fused, in the composer’s words, with ideas for a piece for solo viola he was planning at the time. Waterhouse’s painting takes its lead from Alfred Tennyson’s poem, telling of a woman condemned to experience the world only through its reflection in a mirror. When she rushes to her window to look directly at the knight Lancelot, having caught sight of his reflection, the Lady knows she is cursed. She takes to the river to die. Sørensen describes the woman in Waterhouse’s painting as ‘mad-like, pale, and perhaps singing… alone in a boat without sculls.’ He speaks of his solo viola work, as ‘meandering…like the river.’ But we also hear, in the original score for viola from 1987 and in the transcription for violin made in 1992 recorded here, how Sørensen’s music reflects the inevitability of decline in microcosm as it slips downward time and again. The violin reaches out only to withdraw; in the mirror-like placing of themes opposite their likenesses or inversions, we hear the intangibility of a reflection. Ultimately, even that reflection drifts away. Some of the string techniques specified in The Lady of Shalott – ‘sul tasto’ (moving the bow over the fingerboard to produce a thinner sound), ‘ponticello’ (moving the bow near the bridge to produce a ‘glassy’ sound rich in overtones) – reappear in Serenissima, written for the violinist and conductor John Storgårds in 2014. The piece opens with a fertile upward cadence whose three-note figure rooted on the note E tries to establish itself against cool emptiness. But as that motif becomes more pressing, the work retreats from it, looking elsewhere to gain sureness and confidence before signing-off on another plain cadence, this time downward. Two Sørensen hallmarks heard in Mignon are also found in a piece from fifteen years earlier. Sinful Songs positions its fourteen musicians spatially around the audience and also asks them to make music using something other than their specified instrument (in this case, the woodblocks which sound in the second of two movements). The positioning of the string, wind and brass players ensures that ‘the music will not sound the same at any two different points’, says Sørensen, though in this recording, we all experience it from the same vantage point. The idea of ‘spatial’ music goes beyond stage layout and has a notable effect on the piece’s actual design. Firstly, because the music moves at varying speeds around the circle of players and is tossed antiphonally between instrumental groups (at least once, we hear a throbbing wave pass through the ensemble). Secondly, because the space that exists between the notes – separating the pointillist wind conversation in the work’s second movement, for example – doesn’t just contextualize the discourse, but becomes a part of it. Sometimes the piece’s Classical design comes to the fore; the fourth movement builds on the steady oar-strokes of the third, slipping into the Mozartian groove of a minuet and trio and at one point carrying the same throbbing impulse that drifted into that movement and the second of the Sinful Songs. But evident underneath that surface motion is another of Ständchen’s consistent features, as the clarinet, bassoon and horn unite for a coiled, three-part song. Elsewhere, Sørensen’s serenade incorporates the sounds of skin on stone (feet treading on pebbles) and skin on skin (hands being rubbed together). The organic texture of those rubbing hands has an arresting effect when it arrives in the second movement, whose shimmering strings broach the silence like light pencil sketches on a white wall, before the music thickens-up into a lilting dance. While Sørensen was working on his opera Under the Sky in 2002, he stopped briefly to fulfill a commission from the German broadcaster WDR and the Oslo-based new music ensemble Cikada. The Weeping White Room is scored for an ensemble of winds and strings anchored, like Mignon, by a piano. Sørensen’s white room is unspecific and perhaps even unknown. But it could well be an annex to Under the Sky, one of whose distinctive themes is heard a short way in on the clarinet. There are more songs coloured by Under the Sky’s yearning in Sørensen’s white room, sometimes hidden by the deft calligraphy of his counterpoint and sometimes, like that clarinet, clearly breaking free. There are real, human songs in addition. This piece, too, speaks of our inevitable collective decline. A transient ticking sound, as if from a clock (another premonition of Under the Sky) speaks of life just as its gradual disappearance does the opposite. Hardly a bar passes in The Weeping White Room in which one instrument or another is not sounding. In that sense, the silence is even more pronounced when it eventually does arrive – creeping around a fast disappearing string chord and eventually enveloping the piano’s isolated, abandoned high D.
Pyramix DAW system with HAPI converter/preamps and Tango Controller. Dacapo acknowledges, with gratitude, the financial support of the Oticon Foundation, Musikforlæggerne and Danish Composers’ Society’s Production Pool / KODA’s Fund for Social and Cultural Purposes.